Now that we’re into 2010, it’s ok to rediscover some old recipes from last year, right? 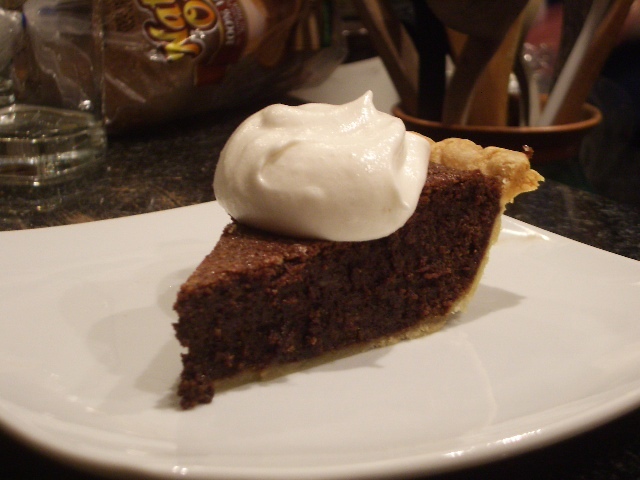 One of our first recipes that we included on 2frugalfoodies was Mom’s Baked Chocolate Pie, or as we also called it, Chocolate Chess Pie. The texture is light and fluffy because of the egg whites but the flavor is incredibly rich. We celebrated with this recipe on New Year’s Eve, and we plan to re-visit it often throughout the year. Here’s where our blog and eating interests collide with things like New Year’s Resolutions to be more health-conscious in 2010. Luckily, this recipe is already online, so if we do go on a health-kick, you won’t have to suffer because of it.